She was signing all their names on a card with much love and flourish, when the cat, the usual one, got his head stuck in a bag and, backing up like a blind idiot, knocked over a full cup of what must have been scalding hot coffee on his precious pink paw pads. The coffee spread like a muddy puddle, soaking all of the cards and one heart-shaped box of chocolates and then trickled down to the seat cushion, where it left a saucer-sized stain. She yelled to the cat “you ruined thanksgiving!” because she was upset and not thinking clearly and he had knocked over a full cup of coffee and she’d only had one, maybe two, sips or perhaps it was a premonition, but he was already long gone, hiding under a chair or inside the curtains that rendered him invisible, surely thinking bags were the devil’s handiwork but only for about five minutes because cats, this one in particular, are not very bright though their hearts are expansive and forgiving. She knew herself to blame since she was the one who asked the volunteer at the animal shelter for the silliest, softest cat they had. Give me one who will hide under rugs and trip us, she said, who will wake us up at 2 and 4 and spill my coffee. Give me one to test the limitless boundaries of my love, again and again. I’m not a big fan at the moment either. And thanks. Noooooooo. Cats are so cuddly! This was delightful! I could see the scene and I promise – I’m not laughing at you…I’m laughing with you! So far so good! (It’s only 11am.) happy v-day! Nice story. Like booze, I love cats but am allergic to them! Happy v day! Ha, better keep away then…happy vday to you too! Maybe some others will join in?? It should go without saying, I hope, how much I love this post! Agreed. Now I know the real reason everything is wrapped in cellophane. I think coffee stains are beautiful. 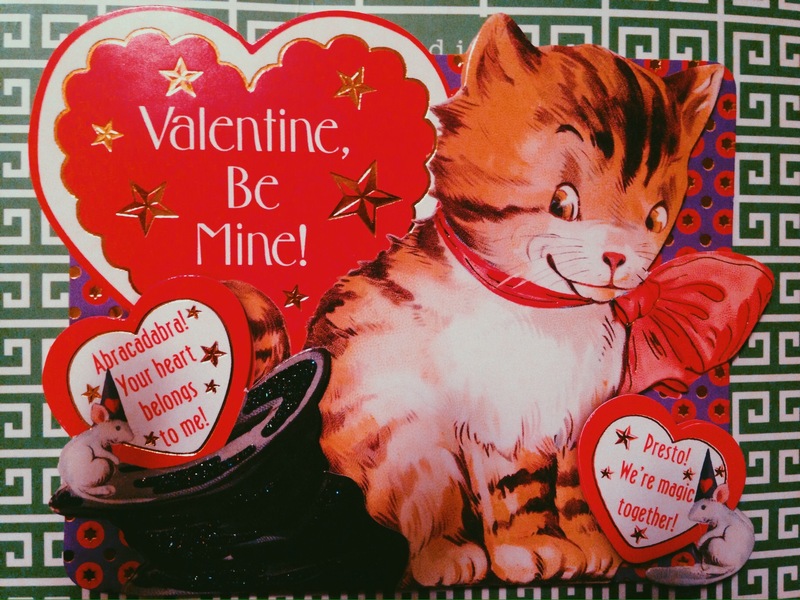 A perfect compliment to cards… We have all kinds of cat-astrophees at our house. Sorry. These were 99 cent cards, mind you, but next year I’m pulling out the card stock and crayons and locking the cat in another room. Who would not want the silliest, softest cat to love and hate and love again even after the coffee is gone? You chose well. Happy Valentine’s Day three days after the fact. This was beautiful!